Max elevation: 1,380 ft.– total elevation gain approximately 1,221 ft.
Storm King Mountain is a mountain on the west bank of the Hudson River just south of Cornwall-on-Hudson, New York. Together with Breakneck Ridge on the opposite bank of the river, it forms “Wey-Gat” or Wind Gate, the picturesque northern narrows of the Hudson Highlands. Its distinctive curved ridge is the most prominent aspect of Storm King. The mountain is a major part of Storm King State Park. With wide views of the Hudson River and the surrounding area, both Storm King and Butter Hill summits are popular with hikers. While Storm King Mountain is thought of as the highest point in the area, its summit reaching approximately 1,340 feet above sea level, the eastern summit known officially as Butter Hill is actually higher, with an elevation of 1,380 feet. There is nothing easy about the trails in Storm King State Park. However, views of the Hudson Highlands and the Hudson River reward hikers far beyond the effort required to arrive at a viewpoint. The park contains a small network of seven trails across a 10-mile span, allowing hikers to minimize retracing their steps, and various loop hikes are possible. I hiked Storm King Mountain in 2016, shortly after starting this blog. Since then I have hiked most of the East Hudson Highlands that sit just just across the Hudson River. From viewpoints on most of those hikes, Storm King dominates the landscape. It was time to stop admiring it from afar and pay it a return visit. Knowing that the trails are somewhat rugged, I kept the hike on the short side. This hike was done in a counterclockwise fashion from the 9W trailhead. Knowing that this is a popular hiking spot, we got an early start and arrived at the parking area by 8:30 am. There were only four cars in the lot when we arrived, but when we returned in the afternoon, it was near capacity. There was a lot of fog on the Hudson River when we arrived. There is a picnic area at the trailhead with several tables that offers a nice view of Bull Hill across the river. The parking area is at times referred to as the Freedom Road Parking Area. “Freedom Road” took the returning American Hostages through the historic Hudson Valley on January 25, 1981. “Freedom Road” was actually a series of roads traveled by a caravan of buses that brought the hostages from Stewart Airport to West Point, their first trip after landing back on American soil. At the north end of the parking area, on the grassy shoulder of the road, there is a tree with a triple-orange blaze, which marks the start of the Butter Hill Trail. Almost immediately, the trail begins to ascend as it briefly parallels the road. In a short distance, the Butter Hill Trail bears right, away from the road and begins to ascend steeply. Soon, views over the Hudson River begin to appear to the right. The mountain across the river is Bull Hill (Mt. Taurus), and the point of land jutting into the river is Little Stony Point (obscured by fog). Looking up, the summit of Butter Hill is visible in the distance. The majority of the orange blazes on the way up are painted on rock. The steepness of the trail would make this a real difficult hike in the snow. In 0.2 mile, the trail reaches three stone pillars, with a stone foundation behind the pillars. These are the remains of Spy Rock House, the summer cottage of Dr. Edward L. Partridge, who served on the Palisades Interstate Park Commission from 1913 to 1930. The trail now descends slightly…..
then continues to climb Butter Hill, gradually at first. A large rock cave sits just off the trail. The Butter Hill Trail then steepens as it continues to climb over rocky terrain. The trail levels off briefly and turns right. After turning right, the trail resumes its steep ascent of Butter Hill. At the top of the steep climb, there are open rock ledges that afford a wide panorama to the east, south and west. Route 9W is visible straight ahead to the south, with the North Ridge of Crows Nest Mountain to its left. Schunemunk Mountain may be seen to the west. We stopped here for a little while to enjoy this expansive view and catch our breath. The trail climbs steeply and at some points we needed to use our hands to ascend. 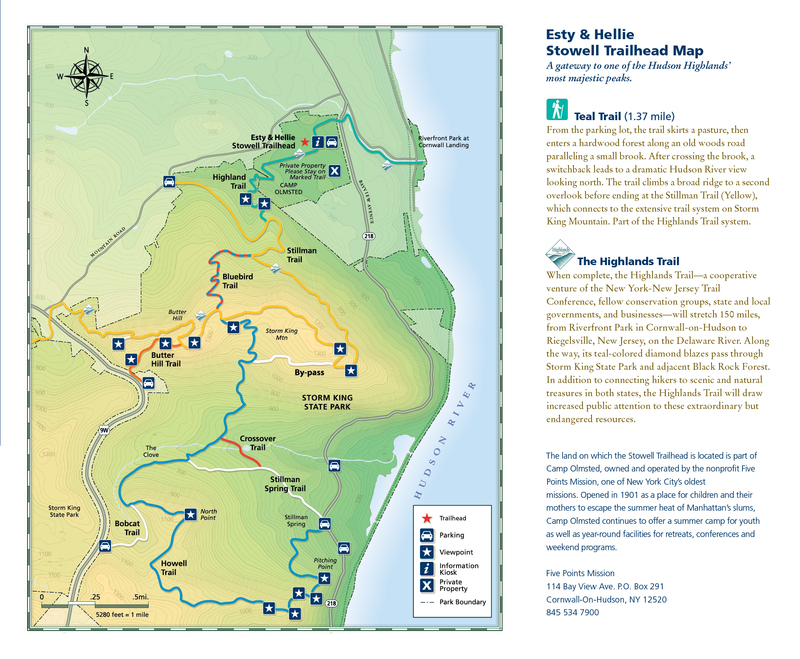 the Butter Hill Trail ends at a junction with the yellow-blazed Stillman Trail, also the route of the teal diamond-blazed Highlands Trail. We turned right and followed the yellow-blazed Stillman Trail up towards the summit of Butter Hill. Standing at the junction, the only blaze visible is teal (Highlands Trail), but once we turned right and walked a few feet, the yellow blazes (painted on rock) become visible as well. On the summit of Butter Hill, a rock outcrop just to the left of the trail provides a 360° view. We missed this viewpoint because I started speaking to another hiker and forgot to look for it. We would be coming back this way on our way back, so all wasn’t lost. Below another view of Schunemunk Mountain to the west. I did stumble upon a United States Coast and Geodetic Survey marker (USC&GS) that is right on the trail. We continued ahead on the yellow-blazed Stillman Trail, which descends slightly. Soon, we reached a junction with the blue-and-red-blazed Bluebird Trail, marked by a large cairn. We turned right uphill, and remained on the Stillman Trail. we reached a limited view to the north. About five minutes ahead, we came to a much better viewpoint looking north over the Hudson River. Pollopel Island is directly below, with the ruins of Bannerman’s Castle on its high point. The rail line running along the east shore of the Hudson is Metro-North’s Hudson Line (also the route of Amtrak trains to Albany). To the east, Breakneck Ridge (marked by the rail tunnel) is visible across the river. The stone building at the foot of Breakneck Ridge (partially obscured by the vegetation) caps a shaft of the Catskill Aqueduct, which tunnels over 1,100 feet below the river. North Beacon Mountain (with communications towers) and South Beacon Mountain (with a fire tower) are to the northeast. The Stillman Trail now continues to descend and soon reaches a junction with the white-blazed By-Pass Trail. We remained on the yellow-blazed Stillman Trail, which turns sharply left. The trail soon reaches another outstanding viewpoint from a rock ledge on the right. This viewpoint faces south, with the village of Cold Spring visible across the river to the southeast, and Constitution Island jutting into the river just beyond. There are several rock outcrops in this area that provide varying views. Below is an image of Bull Hill with Little Stony Point jutting into the river. The Stillman Trail again turns left and descends through hemlocks and laurel, then passes a viewpoint to the north. Pollopel Island, with the ruins of Bannerman’s Castle. The Stillman Trail descends on an eroded stretch of sidehill trail. This is a north-facing trail section, and it is often icy in the winter. In another half mile, it descends a second switchback, crosses a wooden bridge over a ravine, bears left, and descends more steeply. As the Stillman Trail curves to the right, it reaches a junction with the blue-and-red-blazed Bluebird Trail. Just before turning left on the Bluebird Trail, we noticed a stone structure though the trees. I bushwacked a short distance to check it out. I had been here before two years earlier. I think it may have been an old well as it had water streaming out of it. There was also a foundation of a building close by. Now following the Bluebird Trail, which begins a steady ascent. After turning left onto a woods road, the trail continues up the mountain on switchbacks, with limited views to the right through the trees. In 0.6 mile, the Bluebird Trail ends at a junction with the Stillman Trail (marked by a cairn). Bearing right at the junction and continuing ahead on the yellow-blazed Stillman Trail, now retracing our steps. The return trip crosses Butter Hill, giving us another opportunity to take in the 360° views from its summit, which we missed earlier. Another survey marker at the summit. More views on the way down. After descending from Butter Hill, we turned left onto the orange-blazed Butter Hill Trail. We followed it back to the parking area where the hike began. This was a great hike, but it wasn’t easy. I have it listed as moderate – strenuous, but it is more strenuous than moderate. The ascents are steep as are the descents. The eroded section of the Stillman Trail on the north side of Storm King was no picnic either. Since the trail gets no sun it seems to stay wet and there is a lot of slanted rock with a steep drop off. I enjoyed the hike nevertheless. After all, if it ain’t rough, it ain’t right. Pros: Views galore, well marked trails, Hudson River, fun hike. Cons: Popular place to hike and crowds around viewpoints.